MIGHTY GRIP | Pro Chem, Inc. MIGHTY GRIP is a one-component polyurethane adhesive. 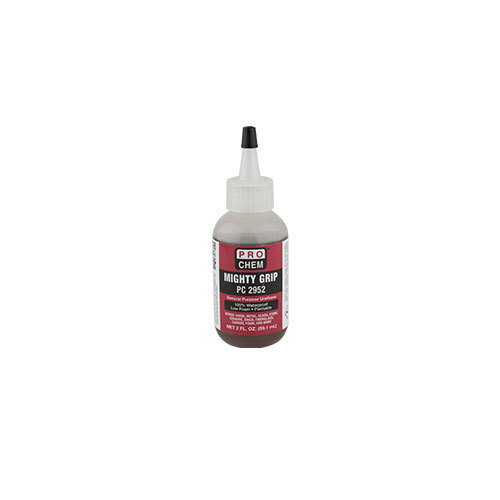 It is a versatile adhesive that bonds all of the materials listed below, and more. It is ideal for building repairs, including interior and exterior wall panels, architectural panels, insulated cooler and cold storage building walls, RV walls, roofs and floors, modular housing construction, entry doors, lamination of structural plastics, composite wall lamination and garage door section lamination. Unaffected by extreme temperature or weather. Avoid skin contact. Wear gloves. Protect work area. Ensure parts are clean, dry and free from oils and grease. Optimum application temperature is 75°F. Dampen one surface with water. Spread a thin layer of Mighty Grip onto the other surface. While curing, adhesive expands 2-3 times. DO NOT OVER APPLY. Press the two surfaces together. Clamp objects together for 1-2 hours. Cure rate depends on surface. Fully cures in 24-72 hours. Squeeze out excess air from bottle and replace cap. Clean up excess glue with acetone.